This article benefited from the review of Dr. David Djang, Seattle Nuclear Medicine, Swedish Cancer Institute PET/CT. It has been one year since the Commentary featured the Axumin PET/CT in the November 2017 issue. A great deal of new research about this scan performance has been published since then. The material in this issue is based on this research. Overall, these studies focus on the Axumin scan, which provides clinically relevant information about PSA levels that lead to significant changes in treatment plans for a majority of men. The Axumin PET/CT scan is available at over 400 locations throughout the USA. Locations can be viewed at the Axumin Imaging Center Location Directory: www.Axumin.com. The Axumin scan’s tumor detection rate varies in relation to the PSA, Gleason score, and PSA doubling time. The Axumin scan’s detection of prostate cancer is determined by the metabolic activity of target tissue, i.e. the rate of uptake of the ersatz amino acid lysine. The sensitivity of the scan will depend on the size of the potential lesion in relation to its proliferation rate. For example, two lesions of similar size will offer different likelihoods of detection depending on their associated PSA, Gleason score, and PSADT. Consequently, any data about detection rates must be considered generalizations without additional details. The decision to obtain an Axumin scan should be informed by these factors. That said, research papers do give important information about detection rates, usually in relation to PSA. An effort has been made in this Commentary to compress the extensive data detailed in these articles by focusing on detection rates at low PSA values, i.e., < 2 ng/mL, the range where clinically significant management decisions are typically made. Detection Rate Data from Parent and Schuster, J Nuc Med, 2018 Mar. The detection rates with the Axumin scan for recurrent disease post-prostatectomy for PSA values of <1, 1-2, and > 2 ng/ml were 72.0%, 83.3%, and 100%, respectively (cited from Akin-Akintayo, see below). In a mixed post-prostatectomy and radiotherapy study, the detection rates for the same PSA values were lower: 37.5%, 91.7%, and 83.3%. The difference in the rates at the <1 ng/mL level, i.e., 72% v 37.5%, could likely be explained by the different mean PSA doubling times: 4.4 +/- 13.0 months in the prostatectomy cohort v. 13.9 +/- 19.9 months in the mixed group. The impact of the Axumin scan at biochemical recurrence (BCR) post-prostatectomy on the decision to administer salvage radiotherapy and the configuration of the target field. The broader issue of the clinical usefulness of the Axumin scan when performed at any point of PSA recurrence during the course of the disease and the scan’s influence on management. Patient characteristics: Median PSA 2.1 +/- 2.96 ng/ml; Gleason score <3 + 4 in 42.9%; >4 + 3 in 57.1%. The mean time to PSA recurrence (>0.2 ng/mL) after prostatectomy was 2.5 years, at which time the Axumin scan was performed in the group assigned to that arm of the study. Findings: Of the 42 men in the Axumin arm, 81% (34/42) of scans were positive. Of these 34, 40.5% had their management changed based on the scan results. 11 men underwent a change to their plan from planned radiation treatment of only the prostate bed to radiation of that area as well as the pelvic lymph nodes; 4 men experienced the reverse, i.e. going from whole pelvis radiation to prostate bed only. The treatment plans of two men were changed from radiation to systematic therapy. Of the 34 positive scans, 12 were positive in the prostate bed only, 2 were positive beyond the pelvis, and 20 were positive in both prostate + extraprostatic regions. The men not receiving the Axumin scan underwent a radiation treatment plan based on clinical history, pathology findings, PSA trajectory, and conventional imaging only, i.e., CT or MRI and bone scans. The comparative outcomes of the two groups will be the subject of a later report. Example #2: Salvage radiation after prostatectomy and radiotherapy – The FALCON Trial (NCT02578940). Patient characteristics: Median PSA was 0.63 ng/mL. The mean time for scanning after initial diagnosis was 4.8 years. Initial Gleason score was <6 in 12 men, GS 7 in 60, and >8 in 13. Findings: The majority, 61.2% (52 of 85) of those imaged had a post-scan change of management. A change from planned salvage radiotherapy to hormone therapy was made in 34.6%, and in 25% management was changed from salvage radiotherapy to observation. These were considered ‘major changes.’ The planned radiation field was altered in 40.4% and this was considered a ‘minor change’. Of the 41 positive scans, 34 were positive in the prostate bed, 19 were extraprostatic, 12 were positive in pelvic lymph nodes, and 9 were positive in bone. The schema: The LOCATE trial compared the management plans prior to and after an Axumin scan in 213 men who exhibited biochemical progression at any time in the course of disease after primary therapy with prostatectomy or radiation. Patient characteristics: Median PSA 1.0 ng/mL (range 0.2-93.5). The mean time after initial diagnosis for scanning evaluation was 54 months. Gleason score at diagnosis was <6 in 27 men, 7 in 134, and >8 in 50. Of the 213 men, 164 had a prostatectomy and 46 had radiation. To be eligible for this study, conventional imaging with CT, MRI, and bone scan had to have been negative (or equivocal, 16%). The most frequent major changes were from planned salvage radiation or from planned systemic therapy to observation only (25%); from planned systemic therapy to salvage radiation (24%); and from planned salvage radiation to systemic therapy (9%). No current imaging technique captures minimal and unseen microscopic disease. The molecularly targeted PSMA PET/CTs are most likely to come closest, with the metabolic Axumin PET/CT one step behind. The sensitivity of the venerable tech99m bone scan and conventional CT scans have been far surpassed. Multiparametric MRI offers the most detailed examination of the prostate gland but is not a total body survey. The examples cited in this Commentary provide short-term evidence of greater disease detection than can be achieved with conventional imaging, resulting in consistently high rates of changes in treatment plans. However, the long term benefit measured by improved progression-free survival or freedom from metastases resulting from these changes has yet to be demonstrated. Akin-Akintayo OO, Jani AB, Odewole O, et al. Change in Salvage Radiotherapy Management Based on Guidance With FACBC (Fluciclovine) PET/CT in Postprostatectomy Recurrent Prostate Cancer. Clin Nucl Med. 2017;42(1):e22-e28. Teoh EJ, Bottomley DM, Scarsbrook S, et al. The FALCON trial: Impact of 18F-fluciclovine PET/CT on Clinical Management Choices for Men with Biochemically Recurrent Prostate Cancer. Journal of Clinical Oncology 2018 36:6_suppl, 165-165. Andriole GL, Kostakoglu L, Chau A, et al. The Impact of Positron Emission Tomography with 18F-Fluciclovine on the Management of Patients with Biochemical Recurrence of Prostate Cancer: Results from the LOCATE Trial. J Urol. 2018 Sep 1. Pii: S0022-5347(18)43798-6. Your comments and requests for information on a specific topic are welcome e-mail ecweber@nwlink.com. Please also visit https://prostatecancerfree.org/prostate-cancer-news for a selection of past issues of the PCa Commentary covering a variety of topics. 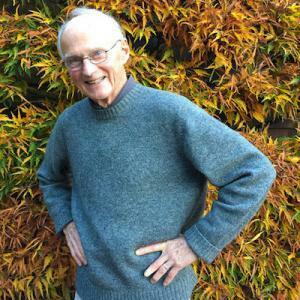 Edward Weber, MD is a retired medical oncologist living in Seattle. Washington. He was born and raised in a suburb of Reading, Pennsylvania. After graduating from Princeton University in 1956 with a BA in History, Dr. Edward Weber attended medical school at the University of Pennsylvania. His internship training took place at the University of Vermont in Burlington, Vermont. A tour of service as a Naval Flight Surgeon positioned him on Whidbey Island, Washington, and this introduction to the Pacific Northwest ultimately proved irresistible. Following naval service, he received postgraduate training in internal medicine in Philadelphia at the Pennsylvania Hospital and then he pursued a fellowship in hematology and oncology at the University of Washington. His career in medical oncology was at the Tumor Institute of the Swedish Hospital in Seattle where his practice focused largely on the treatment of patients experiencing lung, breast, colon, and genitourinary cancer and malignant lymphoma. Toward the end of his career he developed a particular concentration on the treatment of prostate cancer. Since retirement in 2002 he has authored the PCa Commentary, published by the Prostate Cancer Treatment Research Foundation, an analysis of new developments in the prostate cancer field with essays discussing and evaluating treatment management options in this disease. He is a regular speaker at various prostate cancer support groups around Seattle.